Amritsar, the city of Golden Temple in Punjab is inseparably joined with the religion of Sikhism and Hinduism. Amritsar is one of the most beautiful and pure cities of India that can be visited again and again without falling out of love with it. Amritsar was brought into existence in the 16th century and was named after Amrit Sarovar which meant a lake of nectar. This is believed to stand amidst the Golden Temple, the place of worship for the Sikhs. So how would it be like to live in this city for a while? How would the experience be? You must book some flight tickets and come down to check it for yourself. It is believed that Guru Amardas borrowed this piece of land that is Amritsar now, from Emperor Akbar with a purpose of building a tank here. But his sudden death lead the construction pass to Guru Ramdas who finished this mission and also became famous as Chak Ramdas or Guru ka Chak. If you visit the city of Amritsar, you will find some old markets like Guru ka Bazaar which belong to those times. Talking about the history of Amritsar, I can say that it is very rich, enveloping various tales of bravery, myths, narratives and other epic tales like the ones from Ramayana. It is said that the city of Amritsar was the place where has a rich history encompassing various mythical and historical narratives including the epic Ramayana. It is believed that Ram Tirath in the city of Amritsar is the place where Sita gave birth to Luv and Kush in Valmiki’s Ashram. It was Maharaja Ranjit Singh who built the Gobindgarh Fort and Ram Bagh. He was the founder of Sikhism. The ten gurus who are worshipped right from Guru Nanak Dev have passed on rules or call them guidelines for humans to follow and have a better future. These rules are followed till date and every Sikh maintains 5 important things with him for sure. They are Kesh (long hair), kripan (sword), kacha (undershorts), kada (a metal bangle) and Kanga (comb). Though it has so many good things to talk about, one can never forget the tragic Jallianwala Bagh massacre where thousands of people were killed brutally by General O’Dier on the eve of Bisakhi. This happened because there was a rule that people would not be seen publicly in a group more than 3. That is why all these people who had gathered secretly to meet each other on the occasion of Baisakhi were brutally killed. 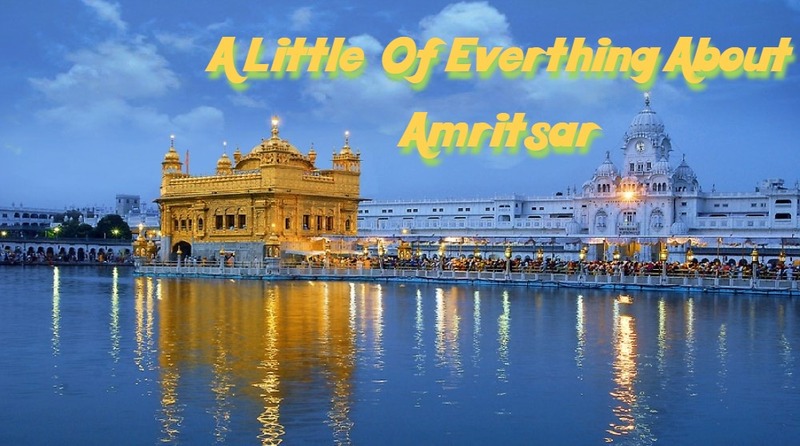 Despite having a tragic incident carved on the walls of every life in Amritsar, life in Amritsar is growing very fast and there are changes seen in various ways. One of the most important colleges, Khalsa Coellge from the 20th century is a great place to receive proper education and wisdom. Moving ahead, there are many schools, other colleges too and sports training centers. Industrial aspects in Amritsar are great as it is famous for Textiles, Pashminas (not exactly the Kashmiri ones) shawls and most importantly carpets. Not only the food and the Golden Temple, there are many other historical monuments, shopping markets, theaters for both reel and real life and many occasions to celebrate. It is said that people in Punjab are loud. To reframe it I would say that people in Punjab are happy and they like expressing their joy openly. They like celebrating their festivals proudly and loudly. They like crying hard, laughing harder, shine bright and smile brighter. Visit the city of Amritsar and let go of yourself in the green fields and breezy air. DESCRIPTION: Amritsar, the city of Golden Temple in Punjab is inseparably joined with the religion of Sikhism. Amritsar is one of the most beautiful and pure cities of India that can be visited again and again without falling out of love with it. So find some time to read this article!